A 60-year-old man was found by his primary care physician to have mildly elevated liver function tests (ALT 46, AST 49) during a routine health screening. He had no other reported medical conditions and was asymptomatic. 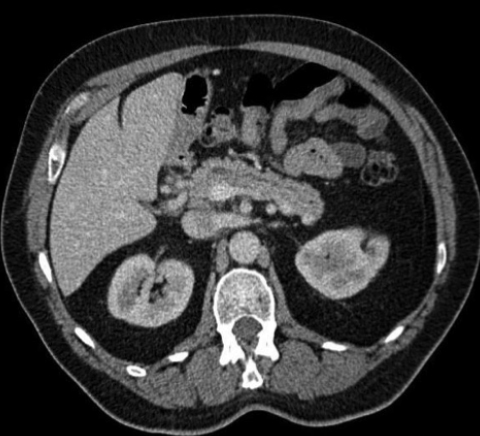 A CT scan was performed to determine possible etiologies of elevated liver function tests. 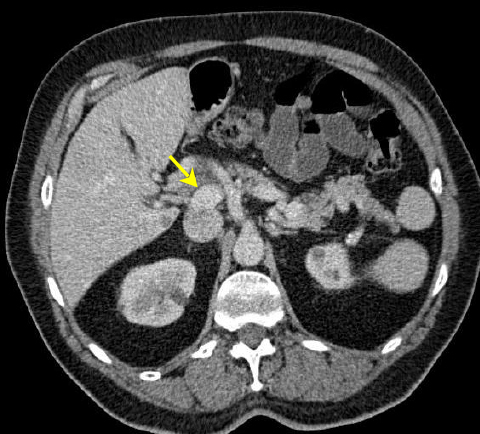 The CT scan revealed anomalous venous anatomy with absence of the intrahepatic portal vein with end-to-side communication of the extrahepatic, hypoplastic portal vein to the inferior vena cava (Figures 1 and 2). Additional imaging findings included a cystic mass at the uncinate process of the pancreas, nodular appearance of the liver and indeterminate hepatic lesions (not shown). The Abernethy malformation congenital extrahepatic portosystemic shunt (CEPS) is a rare entity that most often presents in the pediatric population but may go unidentified until adulthood, as in this case. The malformation is further classified on the presence or absence mesenteric blood flow to the hepatic parenchyma.4 The distinction is important for additional evaluation and management options. Type 1 malformations have a strong female preponderance and are often associated with other congenital disorders. Patients suspected of Type 1 malformation typically require liver biopsy to confirm the absence of intrahepatic portal vein branches and may require liver transplant.3,5 Coil embolization or surgical ligation of the shunt may be options for type 2 malformation.2,3 Radiologists can evaluate CEPS with noninvasive imaging modalities, including ultrasound, CT and MRI. These methods also assist in assessing associated anomalies. 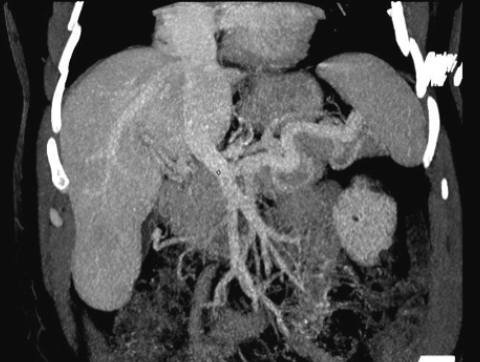 However, conventional angiography is considered the standard reference for depicting the portomesenteric vasculature,3 and may be needed for diagnosis. Abernethy J. Account of two instances of uncommon formation in the viscera of the human body. Philos Trans R Soc Lond. 1793;17:292-299. Howard ER, Davenport M. Congenital extrahepatic portocaval shunts—The Abernethy malformation. J Pediatr Surg. 1997;32(3):494-497. Alonso-Gamarra E, Parron M, Perez et al. Clinical and radiologic manifestations of congenital extrahepatic portosystemic shunts: A comprehensive review. Radiographics. 2011;31:707-722. Morgan, GM, Superina R. Congenital absence of the portal vein: Two cases and a proposed classification system for portasystemic vascular anomalies. J Pediatr Surg. 1994 Sep;29(9):1239-41. Gangadhar K, Nair SV, Sunnapwar A, Chintapalli KN. Abernethy malformation and the spectrum of imaging findings: A case report. NJR. 2013;2:97-102. Murray CP, Yoo S, Babyn P. Congenital extrahepatic portosystemic shunts. Pediatr Radiol. 2003;33:614-620. Thomas KL, Rose TA, Adams M. Radiological Case: Abernethy malformation . Appl Radiol. 2015;44(12):26-27. Prepared by Dr. Thomas and Dr. Rose while serving as Assistant Members of the Department of Diagnostic Imaging and Interventional Radiology, Moffitt Cancer Center, Tampa, FL, and Assistant Professors in the Departments of Radiology and Oncologic Sciences, University of South Florida Morsani College of Medicine, Tampa, FL; and Ms. Adams while serving as a Physician Assistant in the GI Tumor Program, Moffitt Cancer Center, Tampa, FL.